Rachelle Carson-Begley and Ed Begley Jr. in the backyard of their eco-friendly home. Photo by Daniel Deitch. 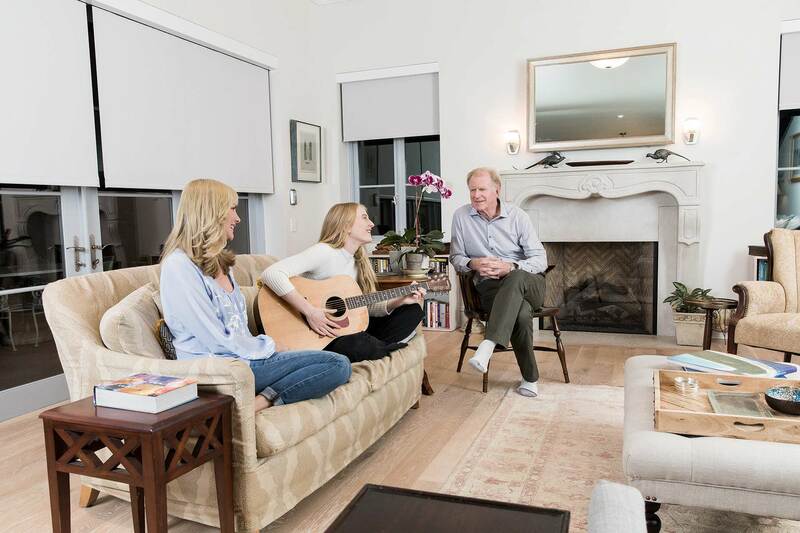 Ed Begley Jr. has acted in more than 300 films and TV shows over his 40-plus-year career in Hollywood, but he’s equally well known for his environmental advocacy. He walks the walk and then some: The early adopter of electric cars has ridden his bicycle and the subway to the Oscars, promoted a line of natural-cleaning products called Begley’s Best, authored two books on sustainable living and lived for 26 years in a modest 1936 Studio City home retrofitted with solar panels and other eco-friendly improvements (as shown in the 2007–2010 HGTV/Planet Green reality series Living With Ed). He might be living there still were it not for his wife of 18 years, Rachelle Carson-Begley, who grew frustrated with the two-bedroom house’s limitations. 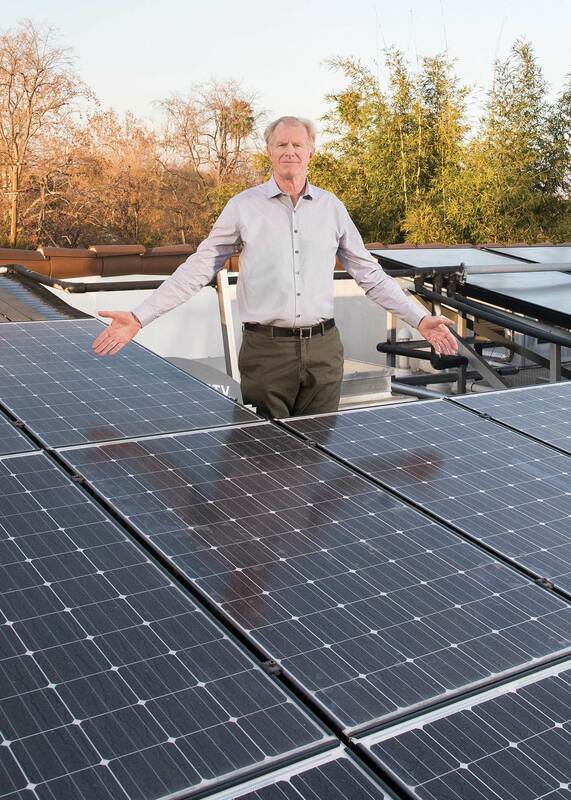 “The only requirement for Ed to move, because Ed was never going to move from the old house, was a south-facing roofline” to capture more solar power than their current home could, she says. 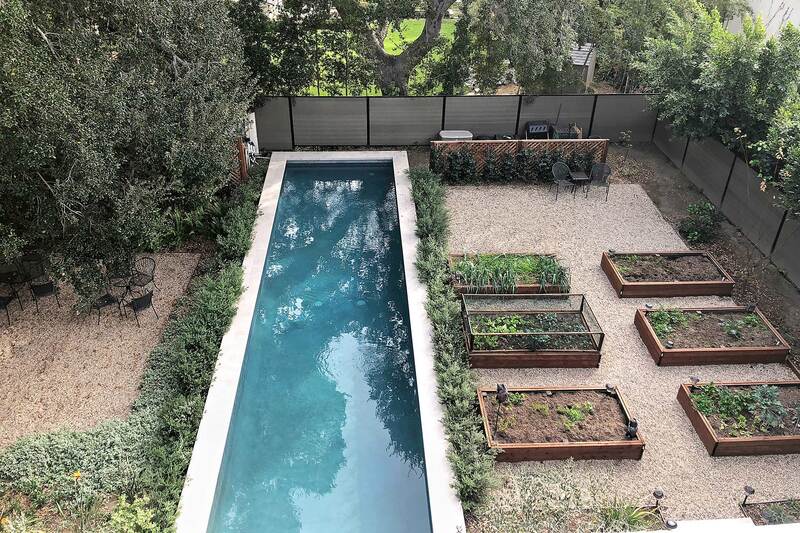 When she found a Studio City property that fit the bill in 2010, they immediately purchased it, planning to do a green remodel and capture the process in an online docuseries, On Begley Street. But after discovering irreparable problems with the existing structure, they embarked on an ambitious project to build a new house that would meet Ed’s stringent environmental requirements while fulfilling Rachelle’s aesthetic vision. It ended up taking five years, with plenty of ups and downs along the way. While the family’s affectionately contentious dynamic is familiar to fans of their shows — Ed the gadget-obsessed eco-warrior, Rachelle the long-suffering lover of beauty and comfort, and teenage daughter Hayden the voice of reason — it’s clear that in reality they’re all deeply committed to environmental issues as well as being thrilled with the look and feel of their new abode. 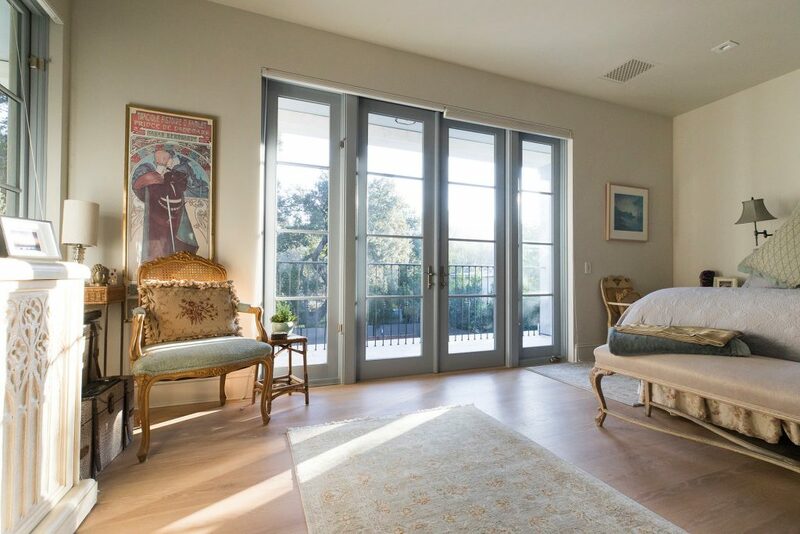 Designed by architect William Hefner and built by Scott Harris of Building Construction Group in Los Angeles, the Platinum LEED-certified steel-frame home incorporates energy-saving technologies into a French Mediterranean design, demonstrating that eco-friendly can also be enjoyable. The Begleys graciously showed us around their innovative home and shared their expertise on going green. When you finally moved in, did anything surprise you about the experience of living here? Ed: I fought Rachelle and the builder and the architect on one key design element: the high ceilings. I said, “You guys got me into this house; I thought originally it was going to be 3,000 square feet or something, now it’s 3,500, and then 3,800, now it’s 4,000. No high ceilings! It’s a waste of steel.” I was outnumbered; I finally caved and went, “OK already, whatever. I lose every battle.” And who likes the high ceilings more than anybody? [Raises hand.] It’s fantastic. Not just because I’m 6’4” — if I was 5’8”, I’d love it. Rachelle: It does give it an appearance of a bigger home than it actually is. Ed: It’s just beautiful. It opens up your whole life. Rachelle: One of my design features that I really wanted was indoor/outdoor living, so that every room on the back of the house would open out. I wanted a very European feel, but with modern touches. The electricity generated by the 9-kilowatt solar system on the roof is used wisely throughout the home. The foam-insulated walls are 12 inches thick and the windows double-paned to prevent heat or cooling loss. Window shades can be programmed to automatically raise and lower at different times of the day to provide natural light and climate control, and the same Lutron switch system also manages the efficient LED lighting. Photo by Daniel Deitch. The home is almost entirely powered by renewable energy. 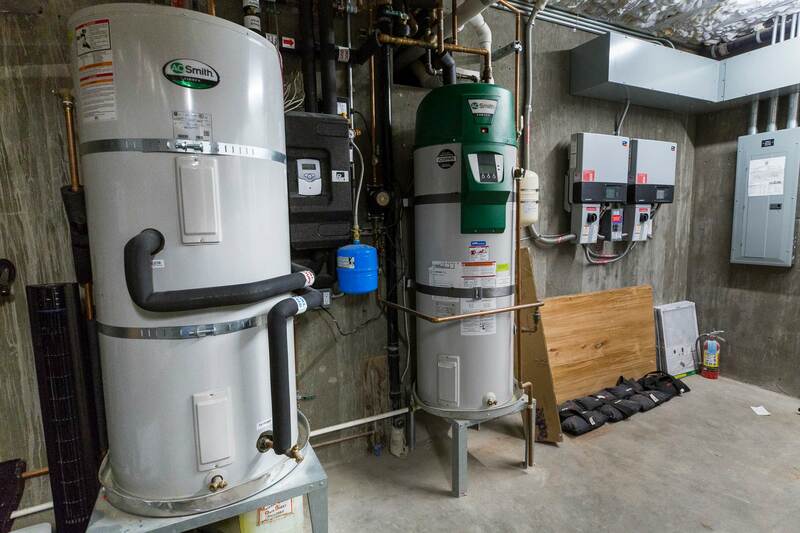 An efficient natural-gas-powered unit backs up the solar hot-water heater on the occasional cloudy day. Photo by Daniel Deitch. Other conservation measures throughout the home include energy-efficient appliances (like this cleverly disguised dishwasher) and low-flow Kohler faucets. Photo by Daniel Deitch. Was it important for the design to fit the character of the neighborhood? Rachelle: It was imperative. I didn’t want it to stand out. I really wanted it to be beautiful but go with the other houses. Because everyone that does green does it like George Jetson — very modern, very boxy. Ed: And it’s so clever, because the solar panels are invisible. You can’t see them from any part of the property. You could be up on a ladder at 7’8” and still go, “Where are these panels Begley’s talking about? I can’t see a one of them. He’s a liar; he doesn’t have any panels on his roof.” It’s brilliant design by William Hefner. The slope of the panels is such that it stays within the profile of that little parapet wall. Do you think that normalizes the idea of a green home — that it doesn’t have to be alien-looking? Rachelle: Right. And so, therefore, if we can do it, you can do it. Ed: And that’s the thing I want to stress. This phone right here, as you know, has a GPS on it. It can help guide you if you’re in a limousine, a midsize car or a super-economy car — this can get you where you want to go. The same thing with dimmer switches, insulation, energy-efficient appliances — good technology can get you there. If you have a very modest budget and a small house, you can use half the things in this house, just on a smaller scale. What are some steps people can take to live greener? Rachelle: I always come at it from a health point of view. The first thing to do is just look at your usage. What are you using to clean your house? What are you using to clean your body? I am very worried about the toxic overload that we’re all experiencing. Mitigate that by getting more natural products in your house, getting fresher air. Your body is your most important home, so addressing that is the easiest, the most simple. Everyone can start voting with their pocketbooks — putting your money where it’s aligned with what you believe and what you want the future to be. Ed: I have my list of things people can do that are cheap and easy. One is bike riding if weather and fitness permit. Riding a bike is one of the most inexpensive ways to get around, and the most energy-efficient form of ground transportation man has ever invented. You can have a bowl of rice and an ear of corn as your fuel, and you can go 30 miles. You need a bushel of corn to make enough ethanol to go 30 miles in a vehicle. I see a lot of people riding bikes in Toluca Lake and Studio City. Rachelle: And they’re walking. That’s the beauty of Toluca Lake or Studio City — the village. You can walk to restaurants. And we live in this gorgeous weather, so we can take advantage of that. Hayden, a musician who’s been writing songs since the age of 5, serenades her parents in the living room, where the floor is made of wood reclaimed from old buildings and the fireplace from a recycled composite material resembling limestone. To furnish the house with sustainability in mind, Rachelle shopped at the National Council of Jewish Women Thrift Shop in Studio City and the Discovery Shop in Toluca Lake; new items, like the sofas, are made of organic materials. Photo by Daniel Deitch. You’ve lived in Studio City for a long time, right? Why did you choose this area? Ed: I grew up not so far from here, in Van Nuys, so I’ve been in the Valley my whole life. I moved to Studio City in ’71. I had a roommate, and I lived right near Vineland and Ventura on Fruitland, and I loved it there. Then I later had a little place right at Tujunga and Moorpark, on Kraft, and I loved it there. I briefly lived for a few years in Ojai and liked it, but I needed to be back in the thick of it, in the city. I found myself moving away from L.A. because of the pollution, and we can’t keep doing that — moving farther and farther away from our work and the center of our lives, and creating more pollution getting to and from wherever it is you want to live. We’ve got to fix Los Angeles, I realized back in the late ’80s, so I decided to move back, and I’ve lived in Studio City ever since. I just love this community. The civic leaders wisely made a decision years ago not to go for the Wilshire high-rise big bucks and kept it low-profile, with height limits and density limits. And another good thing about this area: mature trees. Rachelle: That’s why we bought this property, because of the trees. Ed: That was the heart and soul of the property, the beautiful oaks. Did growing up in the Valley shape your interest in environmentalism? Ed: It did. People ask why I got involved in the first Earth Day in 1970. I got involved because of the smog. The people that were organizing it said, “We’re going to clean up the air and clean up the water.” And I said, “Sign me up. Because I know the air’s dirty; I’ve been breathing it for two decades. I know the water’s dirty; I’ve been down to Santa Monica Bay and seen how dirty it is there. So I’m going to take part.” And I started recycling, became a vegetarian, started using all-biodegradable soaps and detergents, riding my bike even more, taking public transportation, turning the thermostat down in the winter and up in the summer, did some home composting — I was in an apartment then; it was hard to compost, but I did it. Rachelle: Of course he did. Ed: And then I found, lo and behold, not only was I doing good things for the environment, I was doing things that were good for my pocketbook. It all saved me money, so I stayed with it. And from 1970 to today, we have four times the cars in L.A., millions more people, but we have a fraction of the smog. All the stuff we hoped would work did work. You grow many of your own fruits and vegetables; what role does that play in a green lifestyle? Ed: This community has had a great regard for nature over the years. When I lived here as a very young child, there was still a lot of agriculture. There was a lima bean patch across the street from our house! And I know that’s changed, but can’t we have a little bit of agriculture in our backyard instead of a lawn? I could put a lawn back there, but I chose to put a vegetable garden because I like to eat. In celebration of the history of the Valley, I like to bring a little bit of home agriculture into my property wherever I’ve lived. In 1979, when I bought my first home, the thing I wanted to do more than anything else was to have a garden so I could show my kids where food came from. It didn’t come from the Ralphs tree or the Safeway bush; it came from soil, sunshine and water. And they could be involved in that, get their hands in the dirt and enjoy it. And all three of my wonderful kids do just that. What else do you recommend for a greener diet? Ed: Just eat as low on the food chain as you can. Even if you’re a meat eater, have a meatless Monday and see if you like it. As much as you can, limit or eventually eliminate your intake of meat. A cow is like a gas guzzler, because they put out a lot of methane from the front and back end, and it’s really like driving an SUV a lot of miles every year. So if you can avoid it, you’re doing a good thing for the planet. Rachelle: But if you can’t avoid it, go to places that spend a little money on their meats — free-range, hormone-free, grass-fed. We go to Hugo’s a lot, or Granville, [restaurants] where that’s part of their mission statement. And we’ll go vegan. There’s a great Thai vegan restaurant here in town called HOPE, or there’s SunCafe, and there’s another place on Cahuenga called Vegetable. There are some really good options. Ed: Studio City has a great farmers market, and there’s one in Toluca Lake, too. Rachelle and Hayden prepare a salad for dinner. The family eats a plant-centric diet and grows a wide variety of produce in their backyard garden, including citrus, avocados, tomatoes, broccoli, artichokes, corn (Ed’s favorite), greens and herbs. 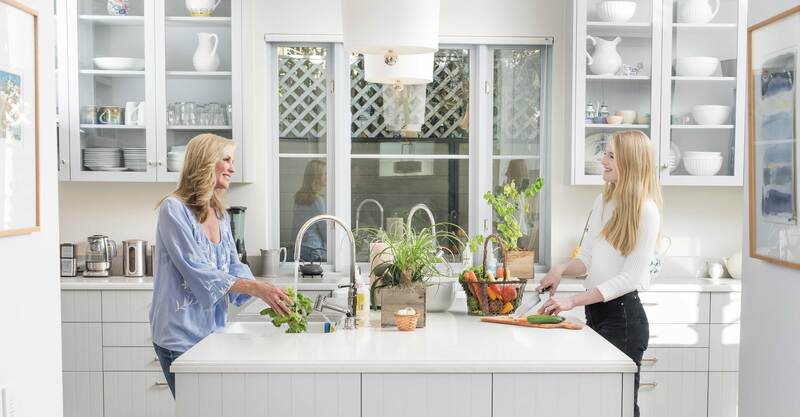 The counter, a sustainably manufactured quartz surface called Caesarstone, is a top kitchen feature for Rachelle. “I love the look and the idea of marble, but one, we’re not going to have it [due to LEED certification requirements], and two, it’s not as durable,” she says. Photo by Daniel Deitch. What misconceptions or objections do you encounter when you talk to people about going green? Rachelle: They all say it’s too expensive. So tell me the list of things that you can do. Can you put some energy-efficient light bulbs up? Can you get some good dimmers? Can you put up some weather stripping? Can you ride a bike if weather and fitness permit? Can you take public transportation if it’s available near you? Those are things that just about anybody, I hope, would be able to say yes to. So do those things first and then we’ll talk about other things later. Everybody wants to run up to the top of Mount Everest. That’s not the way it works. You get to base camp and you get acclimated and you do what you can do. People regularly say, “I want to get solar; give me the number of a good company.” I say, “Here’s the company I want you to call.” They say, “But that’s not solar; it says ‘home energy audit.’” I say, “Exactly.” Before you call the solar company, reduce your demand, then instead of buying a four-kilowatt system, you might only need two. Half the price. Make your home more energy-efficient, get more bang for the buck, save money. That’s good environmental practice. I’m not asking people to do it any differently than the way I did it. When I started in 1970, I was a broke and struggling actor. It took me two decades to get my first solar electric panels. But I could do the cheap and easy stuff. It sounds like the two of you disagreed often while building the house. How did you overcome those conflicts, or is that just how you roll? Rachelle: I think it’s how we roll. Ed: I just cave and I give in, you know. Ed: Radiant acquiescence is the key to my life. Ed: Remind me of the list of the ones that I’ve won. Rachelle: [Pauses.] I don’t know. Let me get back to you. Ed: No, I haven’t won a single battle, so don’t even try to think of anything. You’re wasting your time. Rachelle: I think that the arguing is a loud discussion. Ed: It’s fun banter for us. Rachelle: Maybe not for everybody else, but for us it’s like stress relief. BALANCING ACT When the couple differed over having a pool, they compromised by replacing the original kidney-shaped one with a smaller, rectangular version that would use less water and could be covered to prevent evaporation. The water is solar heated and treated with an ozone system instead of harsh chlorine. Photo by Daniel Deitch. When the pool was completed, Ed came up with an ingenious solution to overcome the limited roof space: He made the existing panels do double duty. “I put the solar for the pool on the back of the solar electric panels. They get hot, so we use that heat on the back of the panels to heat the pool.” Photo by Daniel Deitch. GRAY TO GREEN The garden is watered with rainwater (captured from the roof and stored in a 10,000-gallon tank under the yard), as well as gray water from the household. 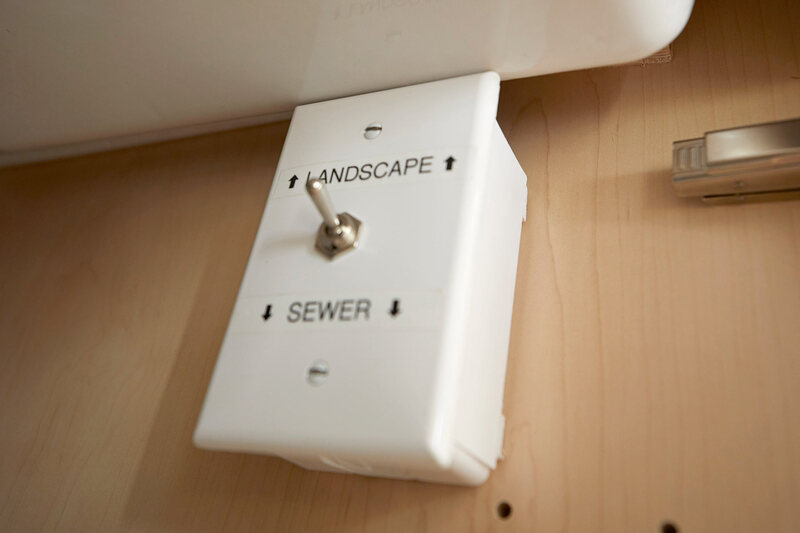 Switches under the kitchen and bathroom sinks and in the laundry room allow the family to choose whether to drain into the sewer (in rare cases when non-plant-friendly chemicals are used) or recycle for irrigation. Photo by Daniel Deitch. It made for good television as well. Why did you want to do the web series? Rachelle: I knew that this conversation was too important. Take me out of the equation; Ed doing his dream home — I knew that people would benefit from learning what worked, what didn’t work. Where would you spend your money? I wish I’d had a reference to go to at the time. Ed: But now that it’s done, we have this wonderful sturdy house that will last for centuries. Wood eventually gets termites or water damage or dry rot. Encased steel — hundreds and hundreds of years it’s going to last. The fire marshal loves you, the termite abatement people hate you; there’s not a lot that can go wrong with a steel home. In an earthquake, it’s very good, too. So we built strong, we built good. Do you feel you achieved your vision with the house? Ed: I’m very happy with it. Rachelle: Yes, I love it. But I’m never finished — I want more landscaping eventually. Ed: I’m done. Put a fork in it. Rachelle: He’s definitely done. I will always be working on the interiors. Ed: Not me, I’m finished. I’m done for life. Rachelle: It’s aesthetics. I’m just so interested in the aesthetics, you know? Ed: I like it, as it turns out. I thought I didn’t care about it. I actually like the high ceilings and the aesthetics and the look. I just wanted infrastructure; I just wanted the boiler room to function properly. It turns out I like a nice promenade deck. Who knew? Ed: Earth Day isn’t just a day. It’s a way of life, really. It’s important what you do the other 364 days. It’s just a day to celebrate what you’re doing over the course of the year — what is possible, what you can do to encourage others to try it themselves. Because, keep in mind: It’s really been very cost-effective for me to do these things over the years. Do the simple stuff first, save some money, put some of that money in the bank, reinvest the rest of it in other green technologies and build and build. Pretty soon you’re going to have enough money to do big-ticket items like solar. I’ve found that you can really save a lot of money if you build smart and make the right decisions when trying green. A luxurious-feeling master bath was among Rachelle’s must-haves. 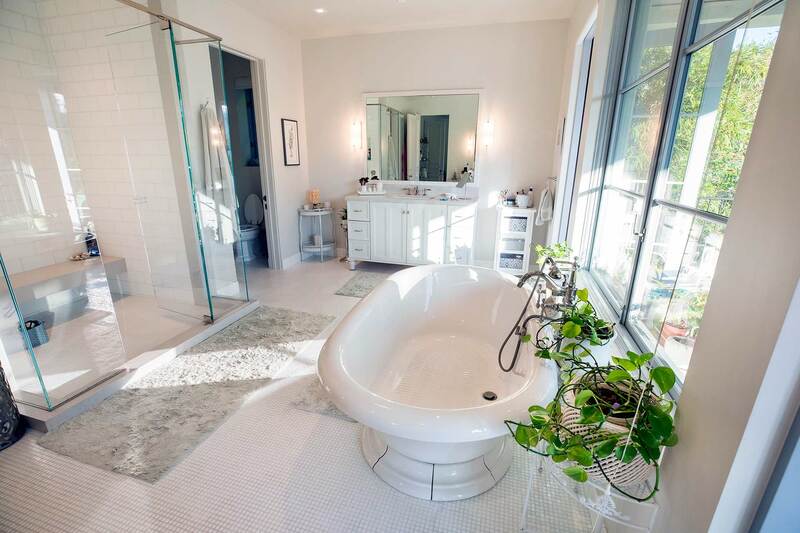 “I think my bathroom is just so peaceful and elegant,” she says, adding that the “phenomenal” 90% recycled iron Kohler bathtub is one of her favorite parts of the house. The bathrooms include a smart system called Act on Demand, with motion detectors that sense whenever someone enters. It activates a circulating pump to bring hot water up from the basement water heater so it’s instantly ready if needed, eliminating the need to let the tap run until it warms up. 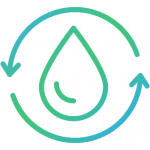 This not only prevents water waste but also saves energy, because the system only turns on when activated instead of running constantly. Photo by Daniel Deitch. KEEPING THE PEACE Like many couples, Rachelle and Ed have differing room-temperature preferences. Their home’s Daikin HVAC system divides the house into four separately controlled zones, allowing one zone to stay warmer while conserving power in other areas. This method of eliminating energy waste also reduces marital conflict — “another form of pollution,” Ed jokes. Our conversation with the Begleys spanned many more topics than we could fit in the print magazine. Here are a few exclusive web extras. I was wondering about your feelings about technology. You seem like a big gearhead. But of course, the rise of technology has also been responsible for the situation we’re in environmentally. Ed: Exactly. You’ve got to recognize that and try to pick technology where there’s a net gain. There’s a lot of pollution that’s come from burning fossil fuels for years. There’s pollution created making solar panels. But what is the bigger number? The bigger number, of course, is burning coal. You come out ahead [with the solar panels]. Without technology we wouldn’t know that there’s an ozone hole and that we’ve started to heal it by banning CFCs. We wouldn’t know that there’s global climate change without good satellite technology. We wouldn’t know without a home energy audit how you can make any home more energy-efficient. That’s a very good use of technology. So not all technology is good, nor is it inherently bad. There’s different degrees, and you’ve got to analyze it and trust reputable people who have done real, credible studies, peer-reviewed science, and then act accordingly. It’s easy to be overwhelmed by bad news about the environment. What still gives you hope for change in the future? Ed: The amount of changes that we have made. From 1970 to today we have four times the cars in L.A., millions more people, but we have a fraction of the smog. And there were jobs created cleaning up that air: making catalytic converters, combined cycle gas turbines, spray paint booths. All those things, big and small, helped clean up the air and employed people. I think that’s something that we have to realize, that making these green choices is also good for the economy. Rachelle: I remember when the first Prius came out, and suddenly in Toluca Lake and Studio City every other car was a Prius. Ed: People wanted to do something. They finally had an option. It wasn’t just those crazy electric cars that I used to drive that were retrofit handyman jobs. They were made by major automobile companies like Toyota. The availability of the vehicles is just great now. Also, look at what we’ve done with the hole in the ozone layer. We’ve had this hole in the ozone layer for years and now it’s gotten better because we banned CFCs. I used to go down to Santa Monica Bay and you couldn’t go in the bay many days a year. That bay has been greatly, greatly cleaned up because of Heal the Bay and others. There’s lots of good news. We’ve got to build on those successes and have more of them. It seems like a lot of it is just making people willing to take action. Rachelle: But if you give them an option, like a Prius, they’re going to take it. What’s an important lesson you think people can learn from your experience? Ed: When you ask somebody, “What’s the cost of this home? What’s the cost of this office building?” any sensible person usually says, “Well, here’s the labor and here’s the materials. This is what it cost me to build this home. Labor and materials.” That’s like looking at an iceberg and saying, you know, “This is the size of the iceberg. It’s this piece that’s this big above the waterline.” Not necessarily. There’s a bigger, bigger, huge chunk below the waterline. That’s the cost of running the house. That’s a cost too. You can’t leave that out. It’s a much bigger cost. So if you spend a little bit more money to build green and build smart, you’re going to save so much money over the life of that home, and you won’t be avoiding that important amount of money spent, which is the cost of running it. Rachelle: And I do believe it increases the value of the home. Rachelle: So we have to encourage people to start where they can, but also to push the envelope a little bit. And look around and see what’s happening, folks. Everyone goes, “Well, I’ll get around to it.” It’s now! We don’t know how long we have, you know? So if this is your legacy, do something. Don’t just stand there, do something. FRESH AIR All the wall paints are non-VOC. “When you get a home that’s this energy-efficient, so well sealed, you don’t want to have any toxins in paint or upholstery, because then you’re breathing those,” Ed explains. Photo by Daniel Deitch.